Seth Godin is a flipping genius. His books "Purple Cow" and "Tribes" blew my mind and helped me to become a more effective leader and marketer, of sorts. He's one of those guys that just seems to know what comes next in an ever-changing, post-Great Recession, open-source business culture. 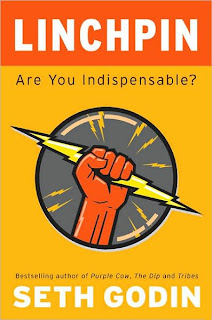 Linchpin is a Godin's left-of-center manifesto on what it will take to be successful in the world that has emerged from the economic carnage of the last few years. In Godin's assessment, traditional forms of leadership are not producing the kind of results in business that they once did. Building on his wildly successful book Tribes, Godin doubly asserts that anyone can become a leader, and that any leader has the potential to be an artist. And in the end, those leaders who care more about creating art than making money, a name for themselves, etc. will find that they are indispensable. I think the one quote that sort of sums up a great deal of what Godin is espousing is simply this: "Organizations that can bring humanity and flexibility to their interactions with other human beings will thrive." Sometimes Godin uses metaphors that are difficult to get your mind around at first. For example, he chooses to use the concept of "The Lizard Brain," as a way of explaining why so many of us stay in survival/fear/flight or fight mode instead of opening ourselves up to our inner artist/adventurer. But once you get beyond the unorthodox terms it all sort of makes sense. 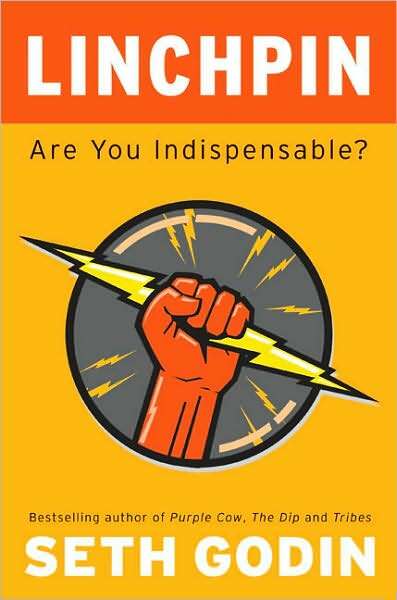 Linchpin is the sort of book that leaders need to read. I believe it's the natural extension of such leadership standards as A Failure of Nerve by Friedman where leaders are called to move beyond the fear that rises through opposition and perceived failure and into creation and production. Order it now if you dare.